1962. Karel Appel show how a real “cobra-artist” paint! Some Evangelicals look down on art as something insignificant or unneccesary. But art is one of the most important aspects of a Christian Worldview. In fact, Christians should be more interested in art than anybody! Why? Because, as we analyze art, we can detect the philosophical, psychological, and spiritual condition of society. Since artists tend to be sensitive and spiritually profound, the frequently understand problems more intuitively, and they express their concerns in their art. Painters, sculptors, musicians, and writers are like cultural prophets. Furthermore, when a Christian produces art, he or she is reflecting the image of God. To underestimate the importance of art is to minimize the importance of man’s creativity. In spite of the general apathy among Evangelicals, there are writers such as Francis Schaeffer, H. R. Rookmaaker, and Dorothy Sayers, who have given us some guidelines for developing a Christian perspective of art. A. Francis Schaeffer Schaeffer, although he was not an artist himself, did much to renew interest in art among Evangelicals. In Art and the Bible,91 he highlighted the fact that Christ redeemed the whole man and that Christ is the Lord of every aspect of life. He shows that art had a place in the Bible, for example in the construction of the tabernacle (Exodus 25-28) and the temple (2 Chronicles 3-4). The Bible contains beautiful poetry and lovely songs. The Psalms encourage us to glorify God with dance and with musical instruments (Psalms 149 and 150). Schaeffer insists that art has value in itself, just for its own beauty, and not necessarily for its “usefulness.” He challenges us to make a work of art out of our own lives. He recommends four guidelines for evaluating art. 91 Francis Schaeffer, Art and the Bible (Downers Grove, Illinois: InverVarsity Press, 1973), pp. 7- 8. 92 H.R. Rookmaaker, Modern Art and the Death of a Culture (Downers Grove, Illinois: InterVarsity Press, 1970). 95 Dorothy Sayers, The Whimsical Christian; 18 essays (New York: Collier, 1978). Also published by the title, Christian Letters to a Post-Christian World (New York: Collier, 1987). 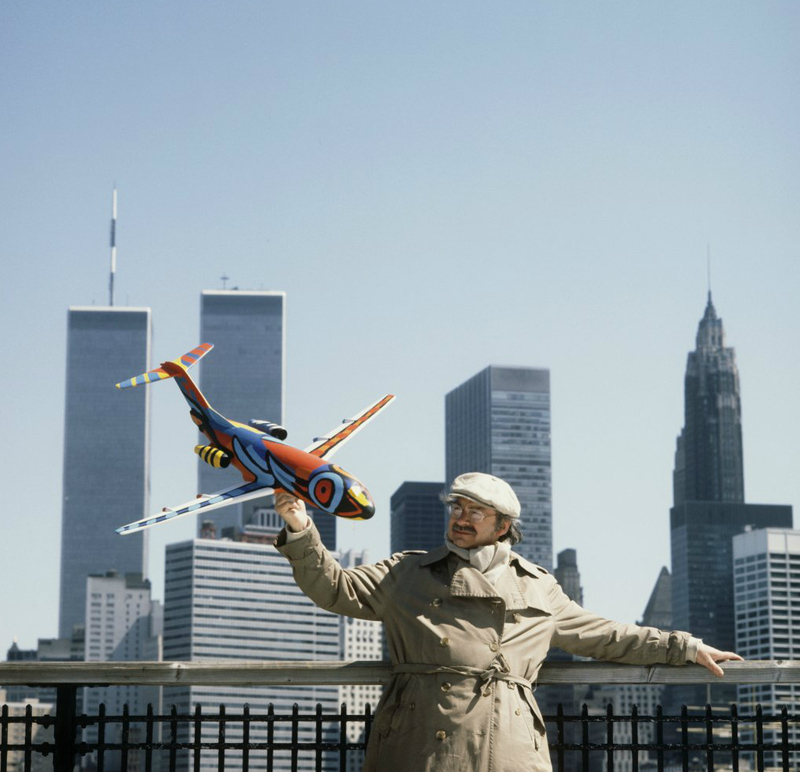 Photo of Karel Appel by Nico Koster (ca. 1983). Image courtesy of the Stadsarchief (City Archives), Amsterdam. Appel was of course right: well before he died in 2006, he had become not only famous but rich. And today, with Amsterdam’s two great museums finally finished with their renovations, visitors to Appel’s native city can enjoy the evidence of Cobra’s, and Appel’s, triumph. The renovated Rijksmuseum devotes two full rooms to Cobra, as does the renovated Stedelijk. In Amstelveen, the Cobra Museum is fully dedicated to the revolutionary movement. And often overlooked, the Ambassade Hotel devotes all eleven of its stately canal houses on the Herengracht to the beauty of Cobra. Karel Appel’s Animal (1953), seen through the front window of the Ambassade Hotel. 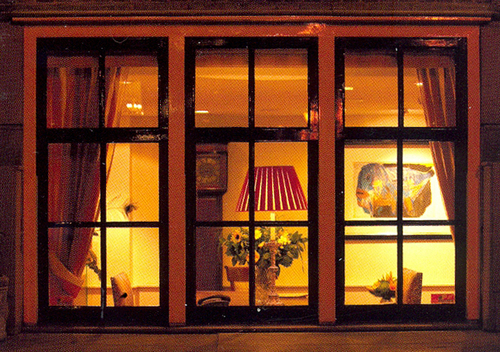 Image courtesy of the Ambassade Hotel, Amsterdam. Among these many exhibitions, Appel’s achievement is recognized by masterpieces. The entrance to the Stedelijk features his 30-foot mural of 1956 for the museum’s old restaurant, including a glowing stained-glass window. A large room with 20 Cobra works includes one of Appel’s greatest paintings, Man and Animals of 1949, and next to the room is the Appel Bar, a mural on all four walls and ceiling originally painted for the foyer of the Stedelijk. Karel Appel, Fountain (2001). Image courtesy Wikimedia Commons. Appel’s enormous Fountain of 2001 guards the entrance of the Cobra Museum, its imaginary rooster towering high above the sidewalk. Inside the museum, major paintings by Appel include Two Figures (1954), and Composition with Animal Figures (1951). 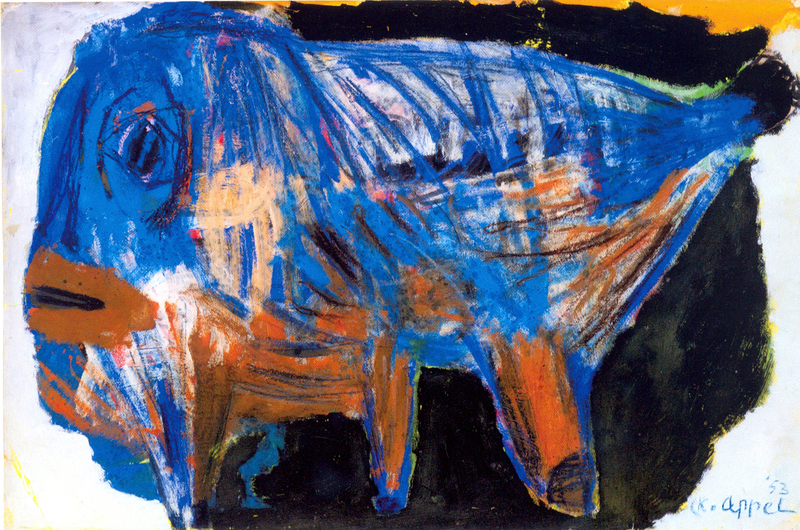 Karel Appel, Animal (1953). Image courtesy of the Ambassade Hotel, Amsterdam. The lobby of the Ambassade Hotel features a magnificent Appel gouache, Animal(1953) – a three-footed fish monster, in beautiful blues and greens. Further along, in the hotel’s Cobra Lounge, is a small Appel drawing from 1948 of his trademark ghostly figures. Karel Appel was a master of both color and form. His vivid imagination constantly yielded new species of animals and ghosts, that lived peacefully together in a world that he created from the earlier discoveries of Picasso, Kandinsky, Miró, Klee, and Dubuffet. He was one of the giants of Dutch modern art, alongside van Gogh and Mondrian, and his greatness is now fully recognized in his native land and beyond. Karel Appel, Man and Animals (1949). Image courtesy of the Stedelijk Museum, Amsterdam. In Amsterdam, I met the famous photographer Nico Koster, who was a friend of Appel’s for more than five decades. Koster laughed as he emphasized that Appel’s early confidence was neither bravado nor a pose: “From the very beginning, Karel had no doubt that this work was something completely new, and that in time it would come to be recognized as important.” Visitors to Amsterdam today can fully enjoy the results of Appel’s confidence, and of his creativity. Christiaan Karel Appel (pronounced [ˈkrɪstijaːn ˈkaːrəl ˈɑpəl] ( listen); 25 April 1921 – 3 May 2006) was a Dutch painter, sculptor, and poet. He started painting at the age of fourteen and studied at theRijksakademie in Amsterdam in the 1940s. He was one of the founders of the avant-garde movement Cobra in 1948. Christiaan Karel Appel was born on 25 April 1921 in his parents’ house at Dapperstraat 7 in Amsterdam, Netherlands. As a child he was called “Kik”. On the ground floor, his father, Jan Appel, had a barber shop. His mother, born Johanna Chevalier, was a descendant of French Huguenots. Karel Appel had three brothers. At fourteen, Appel produced his first real painting on canvas, a still life of a fruit basket. For his fifteenth birthday, his wealthy uncle Karel Chevalier gave him a paint set and an easel. An avid amateur painter himself, Chevalier gave his namesake some lessons in painting. From 1940 to 1943, during the German Occupation, Appel studied at the Rijksakademie van Beeldende Kunsten in Amsterdam, and it was there he met the young painter Corneille and, some years later,Constant; they became close friends for years. His parents opposed his choice to become an artist, leading him to leave home; this was also necessary because he needed to hide from the German police so that he would not be picked up and sent to Germany to work in the weapons industry. Appel had his first show in Groningen in 1946. In 1949 he participated with the other CoBrA artists in the Stedelijk Museum Amsterdam; this generated a huge scandal and many objections in the press and public. He was influenced by Pablo Picasso, Henri Matisse and the French brute-art artist Jean Dubuffet. In 1947 he started sculpting with all kinds of used materials (in the technique of assemblage) and painted them in bright colors: white, red, yellow, blue and black. He joined the Experimentele Groep in Holland together with the young Dutch painters Anton Rooskens, Theo Wolvecamp and Jan Nieuwenhuys. Later the Belgian writer Hugo Claus joined the group. In 1948 Appel joined CoBrA (from:Copenhagen, Bruxelles, Amsterdam) together with the Dutch artists Corneille, Constant and Jan Nieuwenhuys (see also Aart Kemink) and with the Belgian poet Christian Dotremont. The new art of the CoBrA-group was not popular in the Netherlands, but it found a warm and broad welcome in Denmark. By 1939, Danish artists had already started to make spontaneous art and one of their sources of inspiration was Danish and Nordic mythology. It was also in Denmark that the CoBrA artists started cooperating by collectively painting the insides of houses, which encouraged and intensified the exchange of the typical ‘childish’ and spontaneous picture language used by the CoBrA group. Appel used this very intensively; his 1949 fresco ‘Questioning Children’ in Amsterdam City Hall caused controversy and was covered up for ten years. As a result of this controversy and other negative Dutch reactions to CoBrA, Appel moved to Paris in 1950 and developed his international reputation by travelling to Mexico, the USA, Yugoslavia and Brazil. He is particularly noted[by whom?] for his mural work and lived in New York and Florence. After 1990 he became much more popular in the Netherlands; he had several big shows in Amsterdam and in Bruxelles, organized by director Rudy Fuchs. 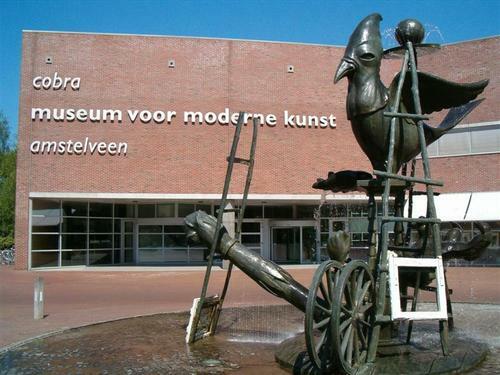 Also the CoBrA-museum in Amstelveen organized several shows with his work. He became the most famous Dutch artist of CoBrA. Appel’s work has been exhibited in a number of galleries, including the Anita Shapolsky Gallery in New York City, Galerie Lelong in Paris, Galerie Ulysses in Vienna, and Gallery LL in Amsterdam. Appel died on 3 May 2006 in his home in Zürich, Switzerland. He suffered from a heart ailment. He was buried on 16 May 2006 at the Père Lachaise Cemetery in Paris, France. Years before his death, Appel established the Karel Appel Foundation, whose purpose is “to preserve [Appel’s] artworks, to promote public awareness and knowledge of Karel Appel’s oeuvre and to supervise publication of the Oeuvre Catalogue of the paintings, the works on paper and the sculptures.”. Kuspit, Donald (2010). “Titanic Power: Karel Appel in the Tradition of the New”. Psychodrama: Modern Art as Group Therapy. London: Ziggurat. pp. 13–45. ISBN 9780956103895. ^ Houts, Cathérine van (2003). Karel Appel : de biografie (in Dutch). Amsterdam: Olympus. p. 13. ISBN 978-90-254-1913-4. ^ Houts, Cathérine van (2003). Karel Appel : de biografie (in Dutch). Amsterdam: Olympus. pp. 13–14. ISBN 978-90-254-1913-4. ^ Houts, Cathérine van (2003). Karel Appel : de biografie (in Dutch). Amsterdam: Olympus. pp. 20–21. ISBN 978-90-254-1913-4. ^ “Karel Appel”. Anita Shapolsky Gallery NYC. ^ “Karel Appel 1921-2006, NL”. ArtFacts.net. ^ Fox, Margalit (9 May 2006). “Karel Appel, Dutch Expressionist Painter, Dies at 85”. The New York Times. Retrieved 2008-06-06. ^ “Karel Appel begraven op Père-Lachaise in Parijs”. De Telegraaf. 16 May 2006. Retrieved 2008-06-06. 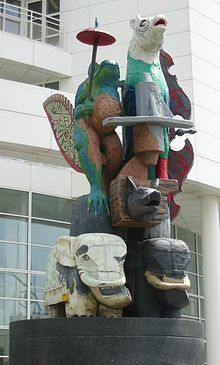 ^ “The foundation – Karel Appel Foundation”. karelappelfoundation.com. ^ Alberge, Dalya (14 February 2012). “Dutch artist’s works found in British warehouse”. The Guardian. Retrieved 2 September 2014. 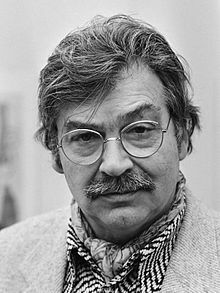 Wikimedia Commons has media related to Karel Appel. Eleanor Antin was born in New York City in 1935. An influential performance artist, filmmaker, and installation artist, Antin delves into history—whether of ancient Rome, the Crimean War, the salons of nineteenth-century Europe, or her own Jewish heritage and Yiddish culture—as a way to explore the present. Antin is a cultural chameleon, masquerading in theatrical or stage roles to expose her many selves. Her most famous persona is that of Eleanora Antinova, the tragically overlooked black ballerina of Sergei Diaghilev’s Ballets Russes. Appearing as Antinova in scripted and non-scripted performances for over a decade, Antin has blurred the distinction between her identity and that of her character. In the process, she has created a rich body of work, detailing the multiple facets of her beloved Antinova, including a fictitious memoir and numerous films, photographs, installations, performances, and drawings. In her 2001 series The Last Days of Pompeii, Antin lingers behind the camera to stage the final, catastrophic days of Pompeii in the affluent hills of La Jolla, California. In The Golden Death from this series, the imagined citizens of Pompeii drown in the excess of their own wealth—an ironic parable of American culture in the throes of over-consumption. Eleanor Antin received a Guggenheim Foundation Fellowship in 1997 and a Media Achievement Award from the National Foundation for Jewish Culture in 1998. She has had numerous solo exhibitions, including an award-winning retrospective at the Los Angeles County Museum of Art in 1999. Antin is a highly respected artist and teacher, and has been a professor at the University of California, San Diego, since 1975. She lives with her husband and son in southern California.